This NASCAR spec. 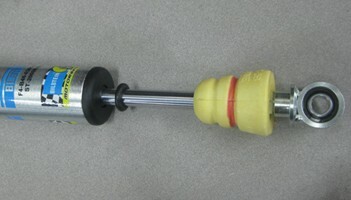 progressive durometer bump stop installs on the shaft of our Bilstein coilover shock and replaces the stock bump stop. This enables you to remove the outer spring tower cover and bump stop allowing a slightly lower ride height. 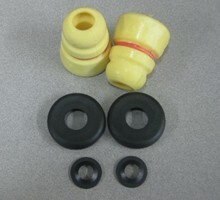 The stock bump stop is extremely hard and has a tendency to upset the handling of the car. The progressive nature of this bump stop slows down the impact when the suspension bottoms out, minimizing the unsettling nature of the impact.